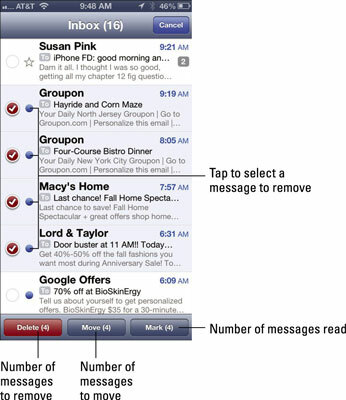 When a message is on your iPhone screen, you can do many tasks in addition to reading it. Check out the figure for the location of the controls. View the next message by tapping the next message arrow at the upper-right corner of the screen (it’s the downward-pointing arrow). View the preceding message by tapping the previous message arrow (the one pointing upward). Flag the message to denote its importance or mark it as unread. File this message in another folder by tapping the file message icon. When the list of folders appears, tap the folder where you want to file the message. Delete this message by tapping the delete message icon. You have to dig in the trash to retrieve the message if you tap the delete message icon by mistake. Go to Mail Settings if you want the iPhone to ask you before deleting a message. In some instances you can archive mail instead of deleting it. Reply, reply to all, forward, or print this message by tapping the reply/reply all/forward/print icon. 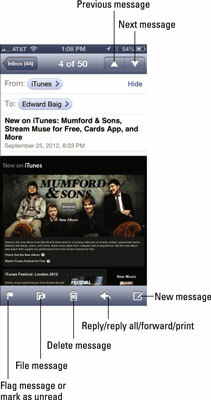 Create a new e-mail message by tapping the new message icon. You can delete e-mail messages without opening them. Swipe left or right across the message, and then tap the red Delete button that appears to the right of the message. In some e-mail accounts, notably Google’s Gmail, an Archive button may appear instead of Delete, depending on whether you turned on Archive Messages in Settings. In that case, tap the button to archive the message; it is not deleted. Tap the Edit button (in the upper-right corner of the Inboxes screen or a mail subfolder screen), and then tap the little circle to the left of each message you want to remove. Tapping that circle puts a check mark in it and brightens the red Delete button at the bottom of the screen. Tap that Delete button to erase all messages you selected. Deleted messages are moved to the Trash folder.